This was quite an advanced card at a time when going past 64K memory in a microcomputer was the norm. This board allowed the Z-100 Model 85-2653-1 computer, to go up to 768K of RAM when these cards were used in a system. The motherboard of course had to first have 192K of RAM. 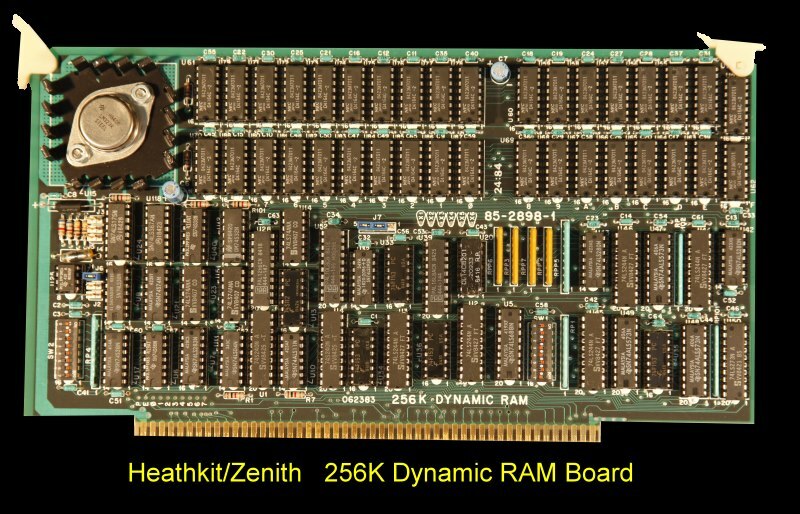 The board utilized 64K X 1 dynamic RAM chips. It could be addressed on any 64K boundary of the S-100's 16 MG address space. There was parity bit error detection in hardware on the board. The board utilized 200 nsec RAMs. The data path could be either 8 or 16 bits wide and 0,1,2 or 3 wait states could be inserted for data R/W. The board in fact met all IEEE-696 specifications. The (very detailed) manual for this board can be obtained here. The schematic for the board can be obtained here. Soon after the board came out a small adaptor board was made that allowed this RAM board be converted from a 256K RAM board to a 1Mg RAN board. The instructions as to how to do this are here.